If you’re having more than your fair share of accidents that come from ladders then it might be time to make sure your employees have been properly trained on ladder safety. The Convergence Training blog might be the best place to start. Ladder Safety course. View a sample and/or contact us to get the full course. Free interactive ladder safety glossary (plus a lot of information and links to ladder safety-related materials). Use the glossary from our blog and/or download a free copy for your LMS. Free interactive “Wheel of Fortune”-style ladder safety word game. Play the game from our blog and/or download a free copy for your LMS. 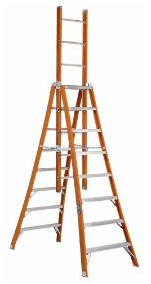 Portable ladder safety checklist. A handy checklist from our friends at NIOSH. This entry was posted in General and tagged FREE, Ladder, Resources, Safety, Training, video. Bookmark the permalink.